Oh my, lots to cover! I am way behind with some things I've wanted to tell you about. First is the bag I ordered from Vicky at Scrap Happy and the neato surprises that came along with it, and also my submission for Amy's Tie One On (which I will get to in a moment, I promise). A brief note: many of you have emailed and asked how my Mom is doing (I love how caring this blogging community is) and I am happy to report she was released yesterday and is now back home and well on the way to making a complete recovery. Between getting her settled and keeping up with deadlines, I'm "socked" in! 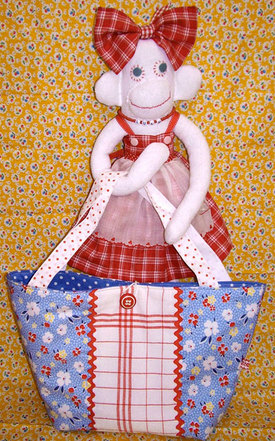 So for this post I will be assisted by Miss Lulu, the sock monkey I made for Loobylu's Month of Softies! Lulu is smitten with the gorgeous bag which I gushed about in an earlier post. It arrived very soon after I ordered it, with some extra special surprises inside! The bag is absolutely beautiful in person, and so well made, it is wonderful. But then, inside, I discovered two adorable little bonus bags, one for tissues and one for... well I'm not sure what it is meant to hold, but it is really really cute, see? And that wasn't all! There was a note from Vicky that said her daughter Grace wanted to include some things for the dollhouse! Isn't that the sweetest thing ever? There was a teensy box with a birthday cake inside, with the most perfect yellow roses, it looks good enough to eat! 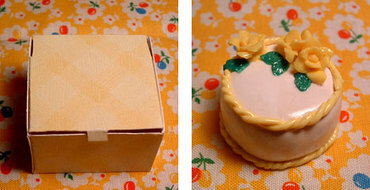 And the cutest little box of pastries, and a bitty doll that fits perfectly in the dollhouse cradle. Thank you so much!!! I was alternately speechless and squealing as I opened each little tissue-wrapped item. Oh! 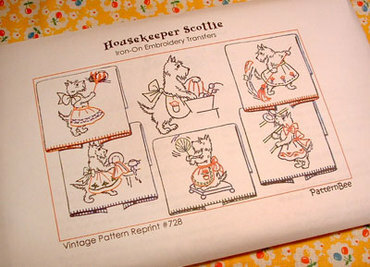 I almost forgot, she also included a set of iron-on scottie dog transfers! Thank you again Vicky, its a wonderful collection of dear things, and you and Grace were so sweet to send them to me. 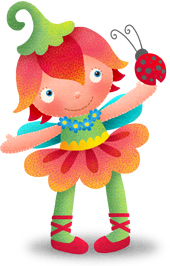 And now back to Miss Lulu, its time to Tie One On. 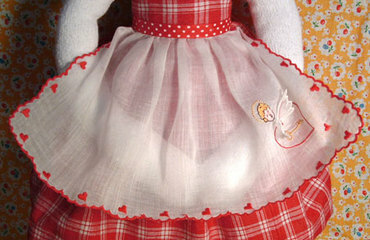 The theme is an apron for a doll or stuffed animal and I hope its not cheating to submit something I made a while ago. 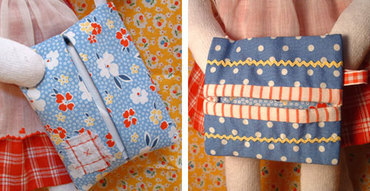 It is made from half of a vintage hankie, gathered and stitched to a bit of ribbon. Too easy, as the edging was already embroidered, and the fabric is the sheer organza they used to make aprons from in the fifties. Even the little embridered detail was there already. More pics on Flickr. This has to be a record post, even for me. I'm worn out!